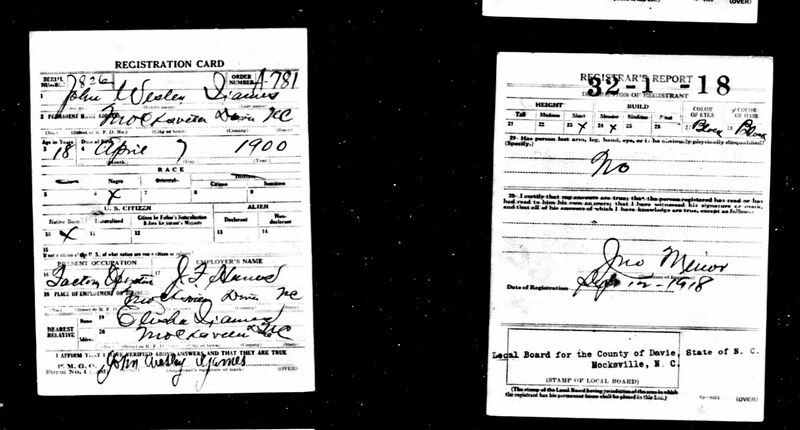 The Draft Registration Card shown here belongs to John Wesley Ijames, born on the 7th day of April 1900, in Mocksville, North Carolina, and died on the 27th day of October 1976. John is the great-grandson to John Wesley Ijames, b. between 1810 - 1812, (d. unknown at this time) a Slave on the Beal Ijames Plantation. Beal Ijames is my 4th great grandfather. As I was doing research on the Ijames family surname I came across this document on Ancestry.com...I was very excited to find this document as it confirms the information I had received. What is so wonderful is to actually see John Wesley Ijames signature on the card along with his father's name, also a confirmation as to the information I have. The first wife of (name unknown at this time) John Wesley Ijames, predeceased him, he then married: Lossie HUTCHINSON CLINKSCALE b. 05 Jun 1903, Abberville, Co., South Carolina; d. 15 Jan 1963, Winston-Salem, Forsyth Co., North Carolina (Source: North Carolina Death collection 1908-1996, Reg. Dist. 34-95; Reg's No. 98; File 1169). Lossie's burial: 21 Jan 1963, Evergreen Cemetery, Winston-Salem, Forsyth Co., N.C.
Elisha 'Lisk' Ijames b. Abt. 1861 in North Carolina and [2nd marriage] Maude Nichols b. Abt. 1880 in North Carolina, the parents of John Wesley Ijames. His grandfather would be: Windfield Brooks 'Slave' Ijames, b. Abt. 1831 in Yadkin Co., North Carolina, and died Bef. 1880 in North Carolina. He married Annie 'Ijames', b. Feb 1833 in Yadkin Co., North Carolina. Part two of the 2nd generation to be posted, which includes the Ancestors and descendants of John Wesley Ijames. Part one of the 2nd generation. 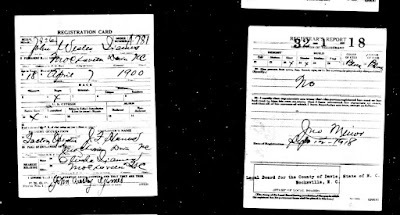 Sources: Ancestry.com World War I Draft Registration Cards, 1917-1918 [database on-line] Provo, UT, USA: Ancestry.com Operations Inc., 2005. Wow, I love that you found this even though it wasn't one of your own ancestors! And it was great that you shared this with everyone, too. I don't think that 'Windfield' used the 1st 'd'. Should probably be 'Winfield'. Doing more research on this line and will let you know what I find! I don't collect the Army Reservation cards. But I have made reference or source for these in the 'Military Notes' for the people I do find. Some tell a great deal about the individual. I was presented the Ancestor Approved award by Texicanwife of Mountain Genealogists and Dionne of Finding Josephine. I am passing the award on to you. You can pick it up at Georgia Black Crackers. Thank you Heather...I was very happy to find this document and share it. 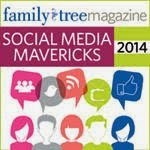 I hope one day a family member will find this and enjoy the information it offers. Anonymous, I agree...I have always felt his name should be spelled without the "d", I wanted to stay true to the way I had received the information and site it factually...if you or I discover differently...I would be happy to change it as it should be. Thank you both for stopping by.